It had been rejected based on the Bank of England (BoE) claiming the information was confidential, the RBA used this response to suggest that release of the information would cause damage to the international relations of the Commonwealth. I lodged an appeal with the OAIC (as recommended by Peter Timmins of Open and Shut) and it was successful (mostly, as explained further down). My request for a list identifying the gold bars that form Australia’s 80 tonnes gold reserves was denied on the basis that it would divulge information shared in confidence between a foreign government (or authority of) and Government of the Commonwealth (or authority of), however the custody arrangement of Australia’s Gold between the Reserve Bank of Australia (RBA) and the Bank of England (BoE) is purely a commercial relationship, rather than a governmental relationship. Furthermore the RBA has revealed to multiple individuals via general enquiry that “at 30 June 2011, 99.9% of the gold is held in the United Kingdom, at the Bank of England”, which is inconsistent with the exemption claim that correspondence between the RBA and the BoE regarding their commercial custody arrangement is confidential. Given that the RBA has openly revealed the location of the gold, further to the total physical amount, there is no reason to expect that revealing the physical properties of the bars would in any way risk the security of the asset. Releasing the document/s requested is in the matter of the public interest. How can the BoE restrict the ability of the RBA to comply with a valid FOI request regarding a matter of public interest in the stewardship by the RBA of the Australian public’s gold? The US Government has published a bar list of deep storage gold reserves in the matter of transparency and public interest and I think it’s a reasonable expectation that Australia follows this lead in order to allay any fears of the public, proving that the gold is there and physically accounted for. The review process took some time, it was around 7 weeks from initial contact with the OAIC to this point. We are in a position to release to you melter/assayer, gross weight, assay and fine weight information relating to the bars in the inventory. The only information we will withhold from release are the individual bar numbers, as this information remains confidential (in the opinion of both the Bank of England and the Reserve Bank of Australia). The Bank of England (as our custodian) use their own numbering system to uniquely identify each bar and have reaffirmed to us that these numbers should not be disclosed to third parties as the information is confidential. We note that this information is broadly consistent with the example you quote in your application for review (namely the US inventory of deep storage gold reserves), although our list is not aggregated into groups of bars. The Bank is of the view that withholding of the bar details is required, to ensure that our obligations to the Bank of England (in terms of confidentiality of their information) are maintained. This also accords with the burdens placed on the Bank in terms of section 33(a)(iii), which exempts information the disclosure of which would, or could reasonably be expected to, cause damage to the international relations of the Bank. Section 33(b) also exempts ‘any’ information exchanged in confidence between the Bank of England and the Reserve Bank of Australia. ... If a refiner is not listed in the RBA document, then it's not shown in the other columns. PercentageGLDCurrent = every single gold bar currently in GLD (approx 64,000 in this sample). Basically what you can see is that the BoE composition is somewhat different. 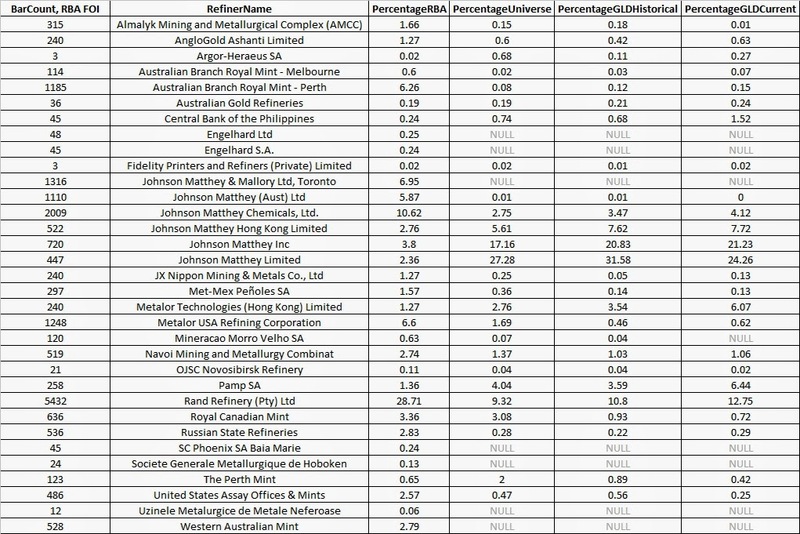 I haven't yet checked for any direct matches for weight, fineness + refiner, but a few random checks on the Royal Mint bars were negative, it's my guess the only matches to ETF data would be coincidental (i.e. expected from statistics). 4. Allocated gold is gold deposited under a safe-keeping or custody arrangement. It is “a specific and uniquely numbered physical piece of gold, which remains in the ownership of the individual or institution placing it for safe custody with a bank” (paragraph 15 of Philip Turnbull, BOPTEG issues paper # 27A). The owner of allocated gold keeps legal ownership over the allocated gold even if it is deposited with a custodial facility provider. In the economic system, it remains an asset without a counterpart liability. 5. Unallocated gold represents a claim on a fixed quantity of gold. “Account providers hold title to a reserve base of physical (allocated) gold and issue claims to account holders denominated in unallocated gold. The account holder does not hold title to physical gold but instead holds an unsecured claim against the account provider, in effect a deposit with the account provider” (paragraph 13 of Chris Wright and Stuart Brown, issues paper for the fourth AEG meeting). The account holder does not have legal ownership of the physical gold but is an unsecured depositor. The account holder is a creditor to the account provider, and so in the economic system this asset has a counterpart liability. Unallocated gold targets the professional gold market. 6. In many cases, similar to deposits, an account holder of unallocated gold account deposits its physical gold to its account provided by, for instance, a bullion bank. Then, the account holder undertakes gold transactions (outright purchase/sale, gold swaps, and gold deposits) via the account. But specific gold bars are not ascribed to the holder unless the holder takes delivery of the gold. The bullion bank can use the deposited physical gold for its own trading purpose and so does not necessarily have 100 percent backing in physical gold for the unallocated gold accounts. The changes wipe the review model adopted in the reform package of 2010, and it's back to where things used to be and we know they didn't work properly then. Not to mention the gaps: in effect no one has the leadership function so essential to the culture change talked about for 30 years but still a long, long way off and going in the wrong direction under this government; and no mention also of the what happens regarding the role the OAIC played in moving towards a government wide information policy. The AAT cannot provide inexpensive FOI review - the flagfall is $816, refundable but for $100 if the applicant meets with some success. Not likely to have been an amount I would have risked for the information that was provided to me in this case. With the OAIC being wound up at the end of this year, I would encourage you to get any FOI requests lodged soon if you want the opportunity to have any rejections reviewed by the OAIC given the lengthy process it took for my results.